With Avengers 4 continuing production in Atlanta this week, a new report confirms the inclusion of a character most expected to see in this movie, Brie Larson's Captain Marvel. Ever since Avengers 4 started shooting in Atlanta last month, a few set photos have leaked from the set, and while we don't have any actual images of Brie Larson on the set, now that it has been revealed she's part of the production, it's possible we may get our first glimpse at the actress in costume later this week. Atlanta Filming Twitter reports that both Brie Larson and Chris Evans were spotted in town, presumably on set, although there are no photos of either actor quite yet. You may recall there was a report from July that revealed Captain Marvel will not appear in Avengers: Infinity War, which came just after production wrapped on that movie. That information came directly from director Joe Russo who stated flat-out in a Comic-Con interview that she won't be in Avengers 3, but he didn't say anything about the still-untitled Avengers 4. Besides, it makes more sense for her to show up in this final Marvel Phase 3 movie anyway. Brie Larson's Captain Marvel movie is one of two Marvel movies that will arrive between Infinity War and Avengers 4. Ant-Man and the Wasp will debut in theaters July 6, 2018, just a few months after Avengers: Infinity War, with Captain Marvel arriving on March 8, 2019, just a few months before Avengers 4. Marvel announced Brie Larson's casting by bringing the actress out for a surprise appearance at their Marvel Comic-Con 2016 panel, with many fans speculating that her casting was revealed so early so she could be a part of Avengers 3 and/or Avengers 4. It seems that theory turned out to be true, well, half-true anyway. What's ironic is, while Brie Larson is filming this Avengers sequel first, her own Captain Marvel movie will still arrive in theaters before Avengers 4, the title of which will still remain a mystery, since it is said to be a spoiler for the events of Avengers: Infinity War. 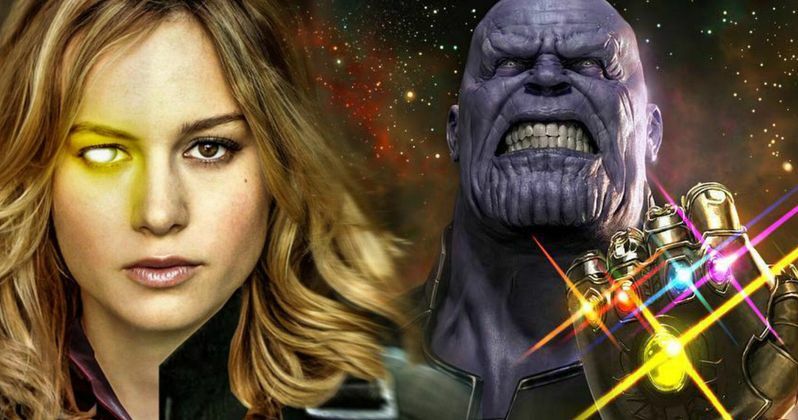 Besides, it makes sense that she'll get her own origin movie first before joining The Avengers, since Kevin Feige already confirmed that they were once considering putting Captain Marvel as part of the new Avengers team that assembled at the end of Avengers: Age of Ultron, but he stated that he wanted to give her a proper introduction into the MCU, which will be handled through this upcoming Captain Marvel movie, which will be set in the 1990s and follow the Kree-Skrull war. It will be interesting if Brie Larson shows up in any set photos, since it will be our first full look at the character, although it will be for a movie that takes place after her own stand-alone movie, and therefore could contain some spoilers if we do get to see any images from the set. The Captain Marvel movie will also bring back Nick Fury, showing a de-aged version of the character in the 1990s, with the character to have both working eyes for the first time in MCU history. There have also been reports that Nick Fury returns in Avengers 4, despite earlier reports to the contrary, which could make sense with the addition of Captain Marvel in this movie. Take a look at the Atlanta Filming tweets below, and stay tuned for more on Avengers 4 as production continues. Hi... #BrieLarson :) (And #ChrisEvans...) Like Chris is an after thought when Brie is here. It's not a spoiler that #BrieLarson is here. Fans aren't dumb. Everyone knows she is going to be in this thing.